Lose a Loved One in an Accident? There is nothing more traumatizing to immediate family than losing a loved one. Not only do you experience emotional pain and suffering, but you may also experience financial difficulties. You face further hardship if your loved one supported you, leaving you with mounting bills. While we cannot bring back the one you lost, we can hold the responsible party accountable through a wrongful death lawsuit. A Denver wrongful death attorney from our law firm can explain your rights and options, and can help you seek relief from your economic challenges. If you have lost a loved one in any type of accident or due to a preventable injury, then the law gives you certain rights. A compassionate and aggressive wrongful death lawyer can help you protect these rights. At Lampert & Walsh, LLC, we fight for you to get justice for your deceased family member. Our Denver law firm’s wrongful death attorneys have been representing injury victims and their families since 1979. We give our clients individualized attention and don’t back down when the other side puts up a fight. What Is a Wrongful Death Claim in Colorado? Wrongful death lawsuits are a way for the deceased and their surviving family to hold the liable party accountable in civil court. When someone is injured due to the negligent actions or inaction, they are entitled to bring a personal injury lawsuit. When those injuries prove to be fatal, then that right passes on to their estate and family. Duty of Care: To prove someone was negligent, our attorneys must first demonstrate that this person owed a duty of care. For example, doctors owe their patients a certain duty of care, and drivers owe a duty of care to other drivers. Our lawyers will help you understand what duties existed before your loved one’s injury. Breach of Duty: The duty of care must be breached in order for you to be eligible to bring a wrongful death claim. For example, a surgeon could leave a scalpel inside a patient or a driver could run a red light. Our attorneys will need to prove that the breach directly caused your loved one’s death. When someone’s death results from negligence in Colorado, their family or estate is entitled to bring a lawsuit. A wrongful death lawsuit is drafted on behalf of all surviving heirs and family members. However, there are some state-specific rules that you must follow for your claim to be valid. For the first year after the death, a surviving spouse is the only one who can bring the claim. After one year, surviving children may also bring a claim. If there are no surviving children, or if the person killed was a minor, then parents may bring a lawsuit. In Colorado, brothers and sisters are not allowed to file suit for wrongful death. When a Denver wrongful death claim is successful, a jury will award damages. In cases with no jury, this duty will be left to the judge. Each case is different, and even the smallest details can change the amounts that will be awarded. Damages are commonly awarded for medical costs incurred before the death. However, you may also recover funeral and burial costs, as well as lost wages and support. If your loved one was a primary breadwinner, then you may be able to claim the loss of income. Furthermore, you can recover for your own pain and suffering from the loss. In some cases, you may also be able to claim punitive damages. Due to the complexity of Colorado’s laws, it is essential that you retain a reliable law firm. 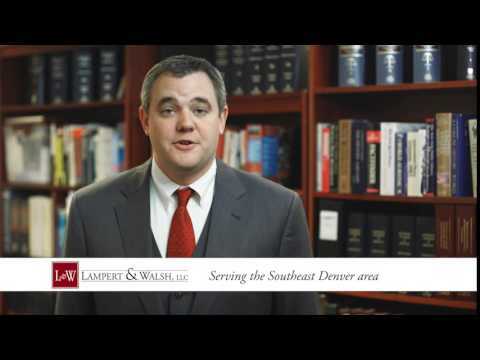 The Denver wrongful death attorneys at Lampert & Walsh, LLC, can explain possible damage awards in your case after a review. Has someone you loved died? Do you believe their death was preventable or caused by the negligent act of someone else? Are you concerned about you or your family’s future? You do not need to feel overwhelmed and alone during this vulnerable time. A lawsuit will not bring your family members back, but it can support your family’s future. Furthermore, with an experienced wrongful death lawyer, you can set standards in law for the future. When it comes to choosing a personal injury attorney, there is no substitute for experience. Lampert & Walsh, LLC is an established wrongful death law firm comprised of skilled litigators. We genuinely care about your best interests. Our law firm handles wrongful death cases in all industries and from any context. With a team of experts, we scrutinize evidence and reports. To arrange your free initial consultation, call us today at 720-489-5848 or contact us online.